Can print in both single sided and Double sided print, this ID card is Ideal for companies who wish to print high security ID cards. Ideal for High Volume this Printer can print over 30,000 cards Per Year. 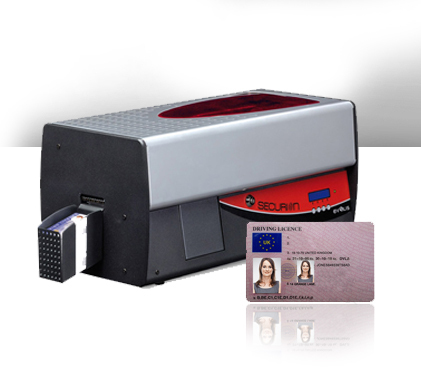 With its one-of-a-kind lamination station, Securion durably protects your secure cards. The printer applies any type of film over the entire surface of the card - from simple varnish to patch films with ultra-high security custom holograms - for premium protection of your cards. Your cards will last for years with virtually no wear and tear. The ribbon used with Securion makes it possible to use direct-to-card printing on polycarbonate (PC) cards. These extremely strong cards are used for sophisticated applications requiring a high level of security. The combination of a Securion printer and Unichrom ribbons offers an economical solution for issuing secure polycarbonate cards. Securion comes with a high-performance dual-sided colour printing module featuring 300 dpi resolution for outstanding graphics. Photos, texts and barcodes are dependably reproduced for quick visual identification. To meet your specific needs, Securion provides data encoding options for magnetic stripe, contact and contactless smart cards. These options can be combined and can be installed on site. Securion is designed to issue secure cards individually or in large runs. In a single pass, your cards are encoded, printed and protected, which saves you valuable time! Two-line LCD display and LED status indicators.